When we ran a reader vote on the best multitool back in 2013, the result was five Leathermans. Leatherman made the multitool wearable back in 2015 with the introduction of the Tread, and it’s about time they turned the Tread into a watch. 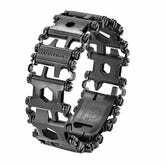 Leatherman Tread Review: Is The Bracelet Multitool Genuinely Useful? The watch face on the Leatherman Tempo is so big that most people won’t even notice it has a multitool band. The design of the Tempo is utilitarian with just enough design touches on the luminescent minute and hour hands, and it’s also quite heavy and submersible to 200m. At $450, the Tempo is exactly double the price that the premium version of the Tread was when it debuted, with premium Swiss movement in tow. The Tempo boasts 30 tools, but somewhat comically, you’ll lose tools in the process of removing link to size down. Most of those tools are screwdrivers, wrenches, and drives, though the more exciting offerings include a bottle opener, strap cutter, glass breaker, file, and a tool for removing links. You can use the Tempo to save yourself from a car sinking in a lake, but it’s not going to start a fire for you. 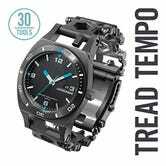 I’ve been wearing my Tempo during outdoor-focused travel since Outdoor Retailer in July, including in Navarro, Joshua Tree, Moab, and Banff, and while it hasn’t helped me prevent a 127 Hours situation, the fact that it’s a watch means I actually pack it and wear it, and the compliments have been plentiful. If you’re going to wear a multitool, it may as well look great and tell the time. Leatherman Signal Review: Can This Multitool Survive?